Since search engines primarily use SEO texts to analyze websites they are also the essence of search engine optimization. However, you must observe a few basics to ensure that the contents are equally effective for users and search engines. The texts must be well-written and the content of the text must be adapted to suit the user – What problems or questions have prompted the user to seek help on your website, and how can your texts be of assistance to him? It goes without saying that the texts must be faultless in points relating to style, spelling and grammar. Anything else looks unprofessional and have a deterrent effect on prospective customers. The texts must also be unique. 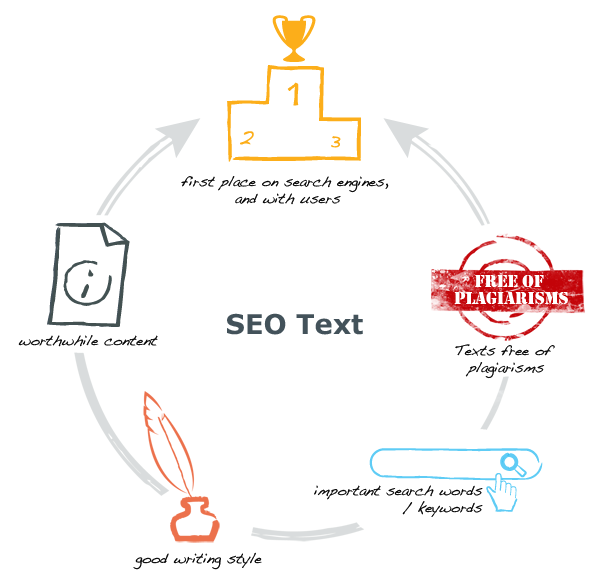 Plagiarisms are recognized by search engines and lead to a devaluation of your website in the search engine ranking. By contrast, texts that are search engine relevant and contain specific keywords have a positive effect. To ensure that you land up front in the search results you must add selected keywords to your text beforehand. However beware, search engines react to so-called “keyword spamming” – the all too frequent use of keywords in texts – with severe penalties. To ensure ideal results in search engine ranking the total share of keywords that are optimized in a text, the so-called keyword density, must not exceed 3-4%. As you see, the creation of SEO texts must take numerous factors into consideration. The more diverse the content of your website, the more difficult it is to be an authority in very area. If you regularly require unique SEO texts, you ought to take advantage of our “SEO texts” services, in particular when the texts are needed in a number of languages for an international website. Our global network of Clickworkers comprises over 600,000 authors. They have provided evidence of their authoring skills in a multi-stage qualification process and have written numerous SEO texts for satisfied customers. You simply assign the topic, style specifications, keywords and the chosen keyword density. Our Clickworkers will take care of the rest! The integrated quality assurance guarantees consistent high quality. Use our Self-Service Marketplace to place your text creation orders. This service is specially designed for smaller or standardized tasks. It involves no setup fees for the wide-ranging project setup and specification. The solutions mentioned here as well as further solutions can be found on the page Our Solutions. If the optimal solution is not listed we look forward to hearing from. We will gladly provide you with an individual solution for your project. We discuss the order with you, advise you with regard to the options, draft the project, divide it into microtasks, offer these tasks to qualified Clickworkers, provide quality assurance, and make the payments to the Clickworkers.